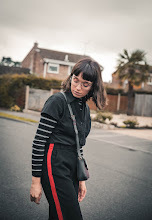 It seems as though flares have recently become my go-to item to wear lately, whether that is dressed down with a simple band tee or dressed-up with something a little more 'glam' and sophisticated. With that being said these ones I bought a while back from the Asos "Reclaimed Vintage" range are the ones that make them the epitome of 'Relaxed Sunday dressing'. They are literally on the same level of comfy-ness as pyjamas. With 'relaxed dressing' in mind, and as the sun/warmth was no where to be seen when these photos were taken, I decided to pop on my beloved faux leather jacket to add a strong contrast to the floral trousers.